Virgin and Child (The Metropolitan Museum of Art, New York), and two paintings in the Musée du Louvre as also being by his hand. The present panel was in the Thyssen-Bornemisza collection in 1930, the date in which it was included in the major exhibition held at the Neue Pinakothek in Munich when this important collection was first presented to the general public. The painting was at that point attributed to the Circle of Giotto based on Wilhelm Suida’s study of the panel. In later catalogues of the collection it was suggested that it was by an anonymous Florentine artist of around 1350. This suggestion was retained until 1989 when Caroline de Watteville published it in the guidebook of works on display at the Villa Favorita as a work by the Master of the Pomposa Chapterhouse. 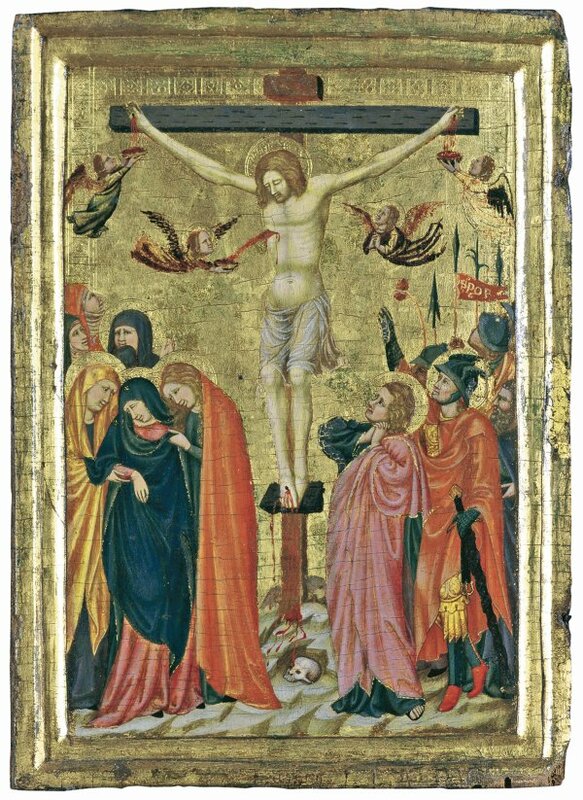 Despite its small size the painting includes a large number of figures arranged in two groups on either side of the cross. In the centre, the dead Christ, with an ample loincloth, rests his feet on a large pedestal. A stream of blood runs from the base of the cross and terminates at Adam’s skull. The artist includes four small angels, one praying with a suffering expression while the other three hold up dishes to collect Christ’s blood that spouts from his wounds. In the case of the wounds on his hands the blood drips down in fine lines while it gushes from his ribs. Standing on a bare Mount Golgotha, the men are presented on the right with Saint John in the front, and the women balancing the composition on the left with the Virgin, who has fainted, supported by the Magdalen and another holy woman. Among the figures that accompany Christ, Nicodemus has been identified as the bearded man on the far right, while the centurion is the soldier in a helmet who raises one of his arms and points to Christ. This group also includes various lances and the sponge with vinegar tied to a branch of hyssop.